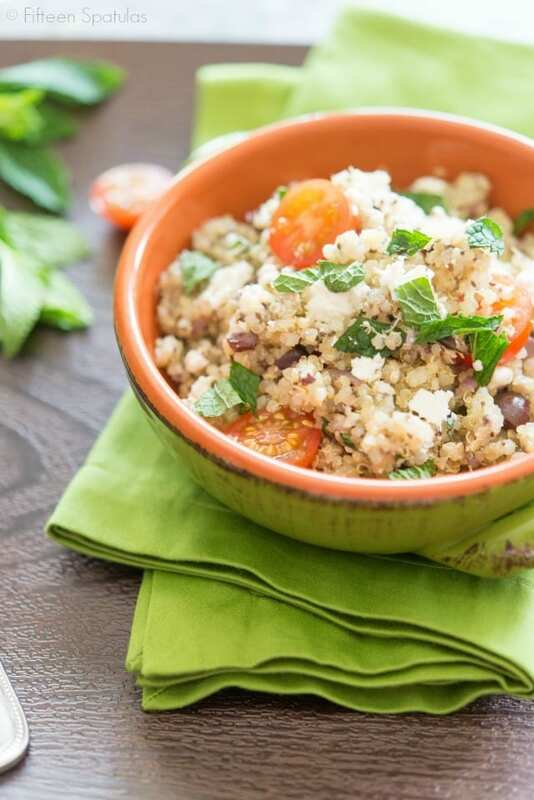 This Mediterranean Quinoa Salad is healthy and delicious, and made with ingredients like feta, tomatoes, kalamata olives, and mint. There is so much fresh flavor in this easy side dish! 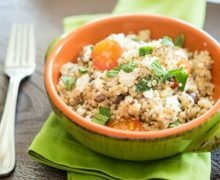 The Mediterranean flavor theme is one of the best combinations of ingredients ever, and today we are bringing it to a healthy quinoa salad. This is one of those recipes that I come back to again and again for stocking my fridge. 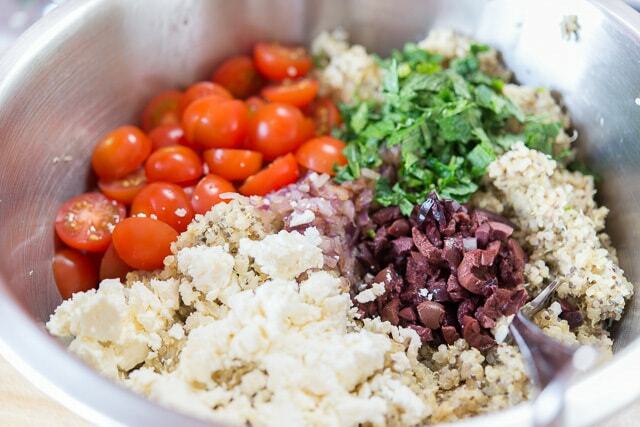 The star flavors we’re adding to the quinoa here are tomatoes, crumbled feta, kalamata olives, and mint, but I also love adding toasted chia seeds. Beyond the nutritional value that chia seeds bring, they also add a wonderful crunch and flavor to the quinoa, since we’ll be using them toasted. 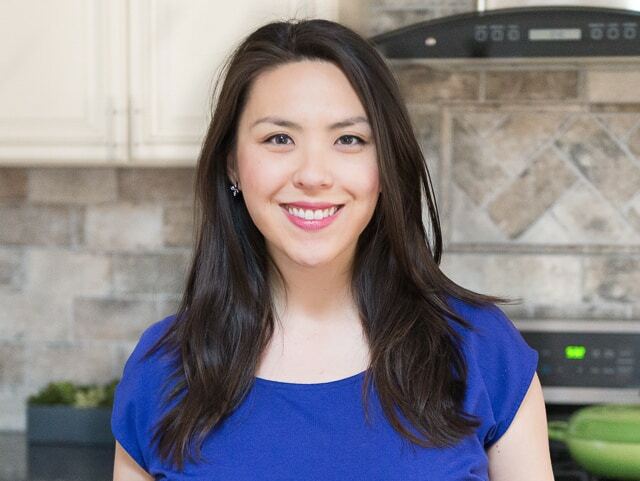 If you haven’t tried Chia Seeds, they have a really nutty, toasty, sesame seed-like flavor to them. They’re awesome. And in addition to their flavor, they have healthy omegas, protein, fiber, antioxidants, and calcium. I like authentic Greek feta crumbles the best, but feel free to use whatever your favorite is. These Quinoa Cakes are another great quinoa-based side dish, as well as these Quinoa Stuffed Peppers and these Turkey Quinoa Meatballs. Enjoy! 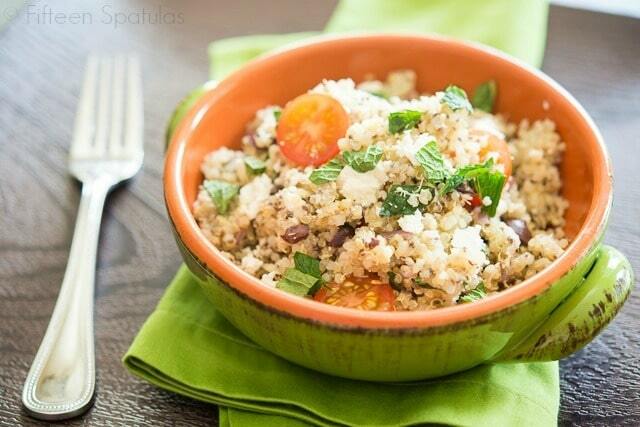 This healthy and delicious Mediterranean Quinoa Salad is tossed with feta, toasted chia seeds, tomatoes, and mint. So much fresh flavor is in this easy side dish! Bring the water to a boil, then add the quinoa and salt. Bring the quinoa back to a boil, then reduce the heat to hold a simmer, and cover the quinoa with a lid (preferably a glass one, so you can see what’s going on). 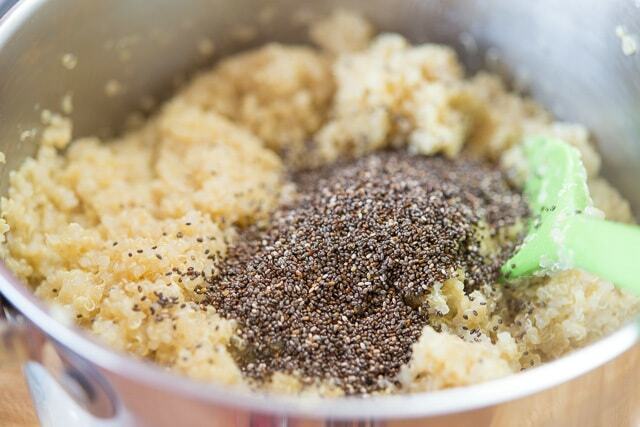 Cook the quinoa at a simmer for 15-20 minutes, until all of the water has been absorbed. 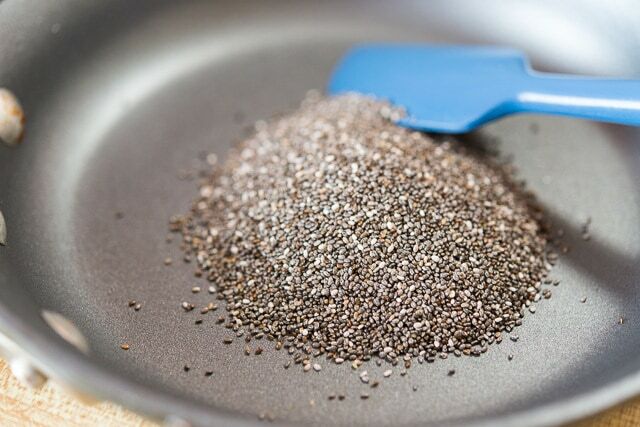 In a skillet over medium heat, toast the chia seeds for about 5 minutes, stirring frequently, until they brown slightly. Be careful not to let them burn. 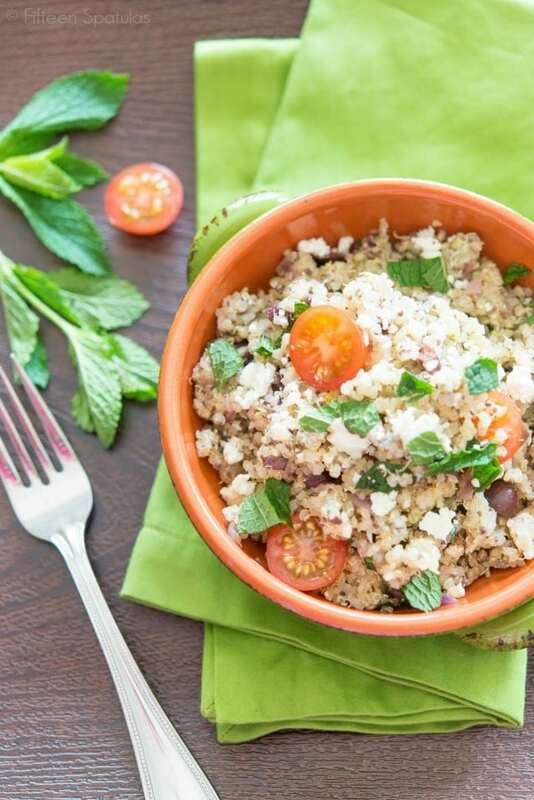 Fluff the quinoa with a fork, and add the chia seeds, cherry tomatoes, kalamata olives, red onion, mint, feta, olive oil, and vinegar. Stir well, then taste, to determine if it needs more salt, pepper, or more oil or vinegar. Serve and enjoy! These Quinoa Cakes are another great quinoa-based side dish, as well as Quinoa Stuffed Peppers and Turkey Quinoa Meatballs. Post updated June 2018 with more writing and tips. Originally published April 2014. This looks so good Joanne! True confession…I’ve never worked with chia seeds OR quinoa. how can I even call myself a food blogger?? 🙂 I will have to try this out, I’ve never heard anyone describe them as tasting like sesame before. Yum. Pretty pictures! Loving the chia seeds! Such a pretty salad! This is my kind of salad! Love these flavors! This is my favorite kind of lunch or light dinner, so delicious!